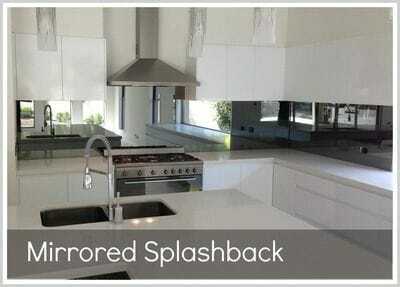 Mirror Splashbacks - Gold Coast | Tweed Heads FREE quotes!! Mirror splashbacks provide a beautiful look to any kitchen whilst at the same time providing a hard wearing easy clean splashback surface. Interior designers often use mirrors to visually expand a small space giving a spacious feel or are used to reflect outside landscapes so views can be seen from more positions in the room. An Ocean Blue Textured Glass toughened mirror will be a stunning addition to your kitchen or bar area. Conventional mirrors are created by applying a silvered paint to the back of a piece of glass. Toughened Mirrors have a unique coating that provides the same reflective surface as a conventional mirror and is slightly grey in appearance. 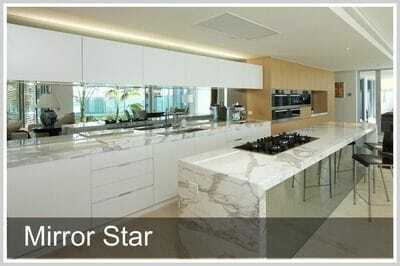 Toughened mirrors will cope with the heat and humidity created behind a stove top. Conventional mirrors cannot do this because they cannot be toughened and are affected by moisture. All manufacturing processes are the same as glass splashbacks, however new technology available also allows our mirrors to be toughened and allows them to be used in areas subject to heat such as behind cooktops. Rather than a silver coating on the back of the glass which cannot be toughened our mirrors have a chromium coating applied that allows the mirror to go through the furnace. Another great advantage of these mirrors is that the chromium coating is moisture and humidity resistant. To meet Australian Standards for the safe use of glass there are many applications where the glass must be toughened to Grade A safety standards. Conventional mirrors cannot be toughened and so their application is limited mostly to being fixed to a wall or needing to have a solid vinyl backing applied over the silvered paint surface. Our mirror can be toughened to meet Grade A safety standards. This opens a world of new applications. Use it as a mirrored wall partition. 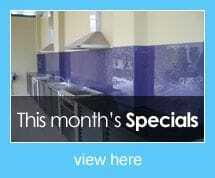 Use it as a mirrored splashback in a kitchen.